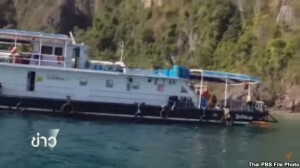 Five try dive boats which have provided try diving services to tourists at the Phi-Phi islands for three consecutive years have left the islands on Friday after they were threatened with legal actions. Mr Sravuth Tanthien, chief of Nopparatthara and Phi-Phi Islands marine park in Krabi province, said that the five dive boats had anchored in front of Ton Sai bay for three years as they provided try diving to tourists but, on Friday, they lifted their anchors and left the islands. The forced departure of the try dive boats followed an inspection to the islands by a team of officials led by Dr Thorn Thamrongnavaswasdi, a marine scientist. The team found out that the dive boats were responsible for extensive damage of coral reefs in the sea around the islands. Mr Sravuth said he would seek a budget from the marine and coastal resources department to erect more buoys around the islands so that tourist boats need not have to drop anchors into the seabed – a practice which contributes to the destruction of coral reefs. He warned that any try dive boats which return to the islands will face tough legal actions. Meanwhile Ms Nalinee Thongthaem, a fishery expert, said that a zoning should be imposed in the sea around the islands for different activities such as such as swimming, snorkeling and scuba diving.